This year marks the 25th anniversary of the Fresno Reel Pride Film Festival. 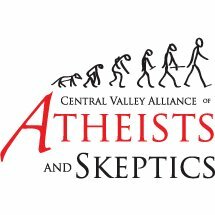 It’s hard to believe that in a conservative area like Fresno, in the even more conservative Central Valley of California, that such a radical event could not only be created, but live to become a force to be reckoned with. Fresno Reel Pride is a true example of what happens when people pull together, year after year, to volunteer their time, efforts and creativity. It’s an example of how the LGBT community can rise above limitations. 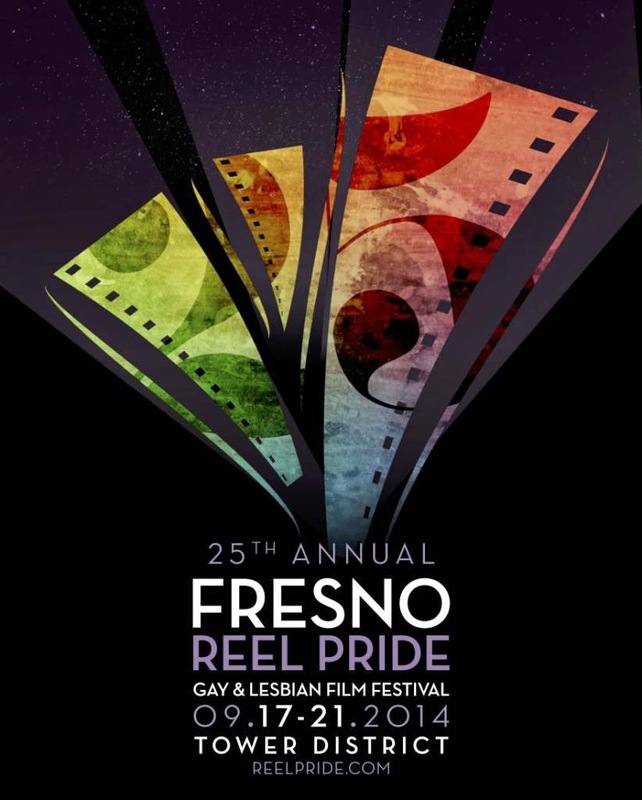 I reached out to Peter Robertson, the 2014 Festival Director and Co-Founder of the Fresno Reel Pride Film Festival, to talk about this year’s festival, and the history behind it. You’ve been involved with Reel Pride since its inception. What first motivated you to work on this project? 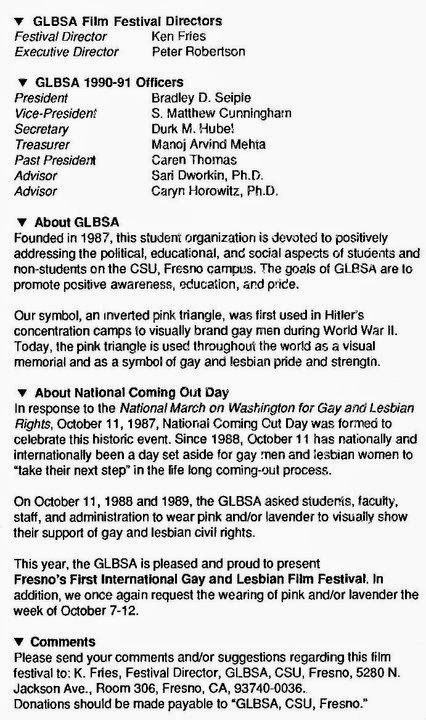 I had been actively involved in the student group – GLBSA (Gay Lesbian Bisexual Student Alliance – now known as USP (United Student Pride) since it was established at Fresno State in the fall semester of 1987. Our first year saw our booth in the free speech area burned to the ground. Our second year had our student funding nixed by the outgoing student body president, but thankfully restored by our incoming student body president. In our third year, the Ku Klux Klan made an appearance near campus protesting us and a student conference we were hosting. 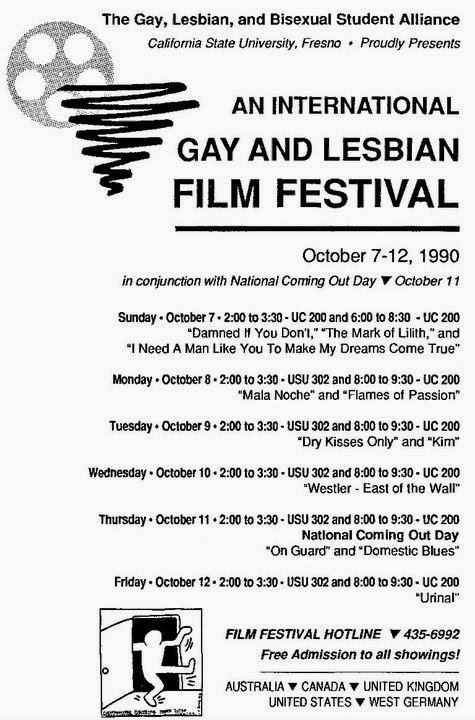 In our fourth year, the fall semester of 1990, fellow student Ken Fries mentioned to me “Wouldn’t it be great to have a Gay and Lesbian Film Festival at Fresno State?” I enthusiastically agreed! 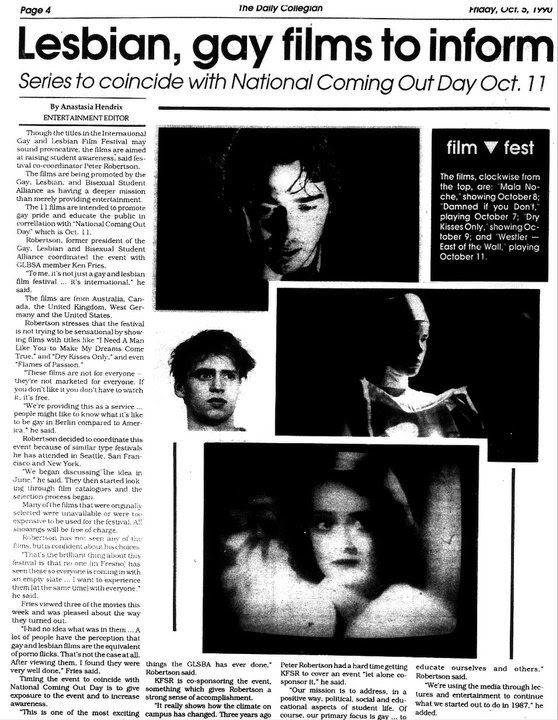 Ken and I eventually co-founded, co-presented and co-produced the inaugural film festival on behalf of the GLBSA, in conjunction with National Coming Out Day. When you were involved with the start of Reel Pride 25 years ago, what were your initial thoughts about how it would evolve, if it would survive, etc.? We didn’t know if we would be successful in year one, much less in year two or in the many, many years to come. The first year we screened 11 films, from five countries, screened two times per day, throughout six days. Some offerings were on film, some were on video, but this was the beginning of an event that has lasted a quarter-of-a-century. Additionally, all screenings were free-of-charge the first two-to-three years, but we did accept donations. 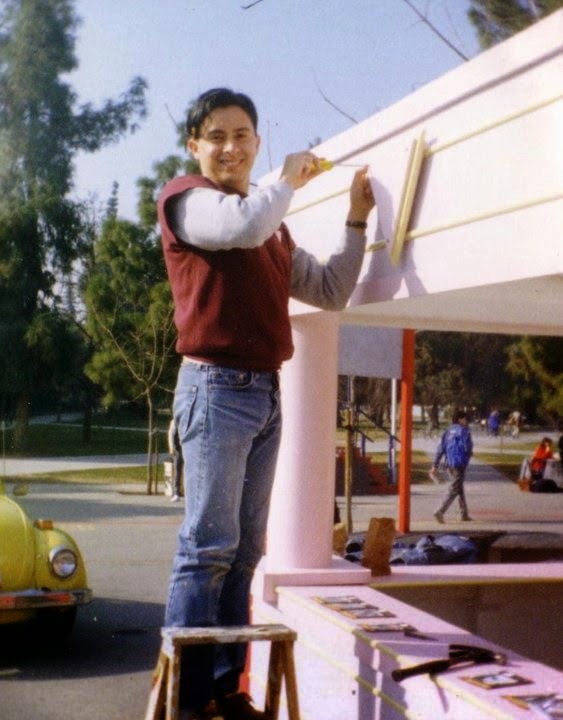 Talk a little bit about the condition of the LGBT community in Fresno 25 years ago and now. Well, Ronald Reagan was President, so that right there will give you “a pulse of society at the time.” The GLBSA was lobbying for three equality-for-all aspects or civil rights issues at the time – the right to an education for all, the fight to housing for all, and the right to employment for all. Marriage equality wasn’t even on the table. And, as you can see, our community is still striving for equal rights-for-all in some of the matters – 25 years later. What are your thoughts in general about LGBT film festivals? Why are they necessary? 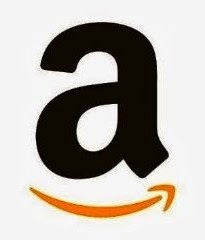 What do they provide to the community? I am so glad that you asked this question! I’ve been asked by members of the LGBTQ community, allies and friends the same question, in different ways. I feel and I truly believe that a LGBT film festival does two things very well – it celebrates our diverse community; and it respectfully remembers the adversity that our diverse community has overcome. We’re in a better place today than where we were yesterday, but not quite where we want to be tomorrow. What about the advancement of gay rights in general? Do you think that the current trend toward national equality will hurt LGBT institutions such as film festivals? Do you feel that they’ll go away? Do you think there’s a danger in us losing our identity in return for blending in? For 25 years we’ve been marching and chanting “We’re here, we’re Queer. Get used to it.” And, little by little people are getting used to it. The LGBT community is assimilating into society and the lines of diversity are getting blurred. We’ve wanted equality, we’re getting equality, and because of that, our community’s identity is being compromised, too. It is my hope that this won’t hurt LGBT events such as pride parades and film festivals, but make these events even more important to our community. As I mentioned earlier, pride parades and film festivals help us to remember from where we came and where we used to be; as well as help to motivate us to where we want to go in the future. 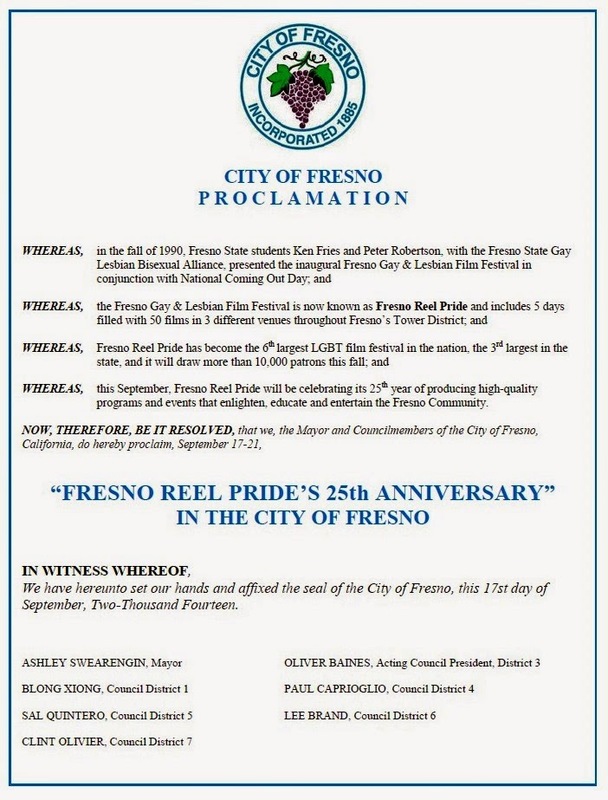 This is a monumental year for Fresno Reel Pride. 25 years. What unique things does the festival have planned? From elected officials, Assembly member Henry T. Perea and State Senator Andy Vidak, have a joint resolution honoring this year’s film festival. 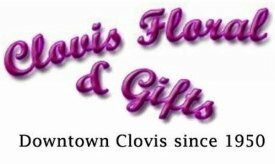 And from Councilmember Blong Xiong, Fresno’s mayor Ashley Swearengin and a majority, but not all, of the Fresno City Council, we have another resolution celebrating our 25th year. What a difference an election year makes, especially across the political aisles! 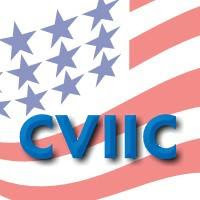 From a donor side, we’ve established an endowment fund with lead gifts of $5,000 made by Ron Wilson, and two $1,000 gifts made by Jim Daggs, plus my husband, Victor Kral, and myself. This helps to ensure a firm foundation for film festivals into the future. And this year, we’re also granting Director Emeritus status to Mr. Wilson, plus Festival Director Emeriti status to Kenneth Fries, Co-Founder; Jeff Robinson and Jera Peterson; as well as Jon Carroll. Are there youth events planned? We have a special, free screening for students on Saturday, in conjunction with a free pizza party with pizzas provided by from Richie’s Pizza & Hot Dogs. What about the parties and other events surrounding Reel Pride this year? What other Reel Pride events should people be aware of? 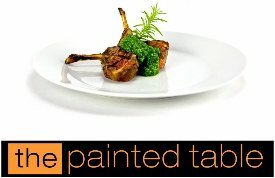 We have the Opening Night and Closing Night Galas at the Painted Table, which require festival passes to attend; as well as a Pre-Party at Bobby Salazar’s, two Women’s Parties at SCORE, and a Men’s Party and Pinot Bar & Grill. All are included in the purchase of a 2014 Festival Pass. For those that spend a little more on their festival passes, we also add a Filmmakers’ Reception at Veni Vidi Vici, plus a Sunday Brunch at The Painted Table. For those that haven’t purchased festival passes, how long will those be available for purchase and what will it cost to purchase individual tickets to films on a daily basis? 2014 Festival Passes are $95 per person and include access to 50 movies throughout five days in three venues, plus access to a majority of the parties. 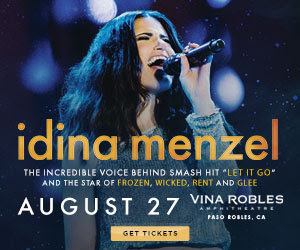 Individual tickets are $10 and up, depending on the film and the venue. Fresno Reel Pride is an official nonprofit organization and all those working for Reel Pride do so on a volunteer basis. Talk about how important it is for the community to support not just your nonprofit, but other LGBT organizations as well. This year, 2014, has been a year of unexpected transition, but we have an amazing, tireless and wonderful team of board members that have “risen to the occasion” to ensure that our community’s film festival will take place this year, as well as into the years to come. I must recognize them for giving their time and talent to support Fresno Reel Pride’s 25th annual film festival: Kat Reyna’s the first female president of board in 15 years; Jon Carroll’s been a mainstay for more than a decade and serves as vice president and programming director; Brian Carnes is a new board member and serves as our treasurer; Augie Blancas is our secretary and communications director; Justin Kamimoto serves as our outreach director and organized our silent auction that raised more than $10,000 (our most successful silent auction to-date); Christopher Dodd has returned as festival pass guru and we've seen a tremendous increase in sales from previous years; Michael Reyna is another new board member that has hit the ground running to raise more than $65,000 in sponsorship revenue (our biggest year, ever in sponsorship revenue); and Tiana Perez of the Fresbians is a new board member who has stepped up to organize our volunteers. I sincerely applaud and heart fully salute each of these volunteer board members in not only ensuring a 2014 film festival will take place, but that a 2015 film festival will also take place. I’ve repeated this phrase over-and-over during the past six months with members of our LGBT community that have been wavering on their continued support of Fresno Reel Pride this year – “This is not my film festival; this is not your film festival. This is our community’s film festival! If you support our community, then you will support this year’s film festival.” It’s as simple as that. Period. I’ve also added this statement in the past month: “Just because you try to blow out Fresno Reel Pride’s candle, it won’t make your candle burn brighter.” Those that read this will know that this statement speaks directly to them, to their words, and most of all, to their actions. 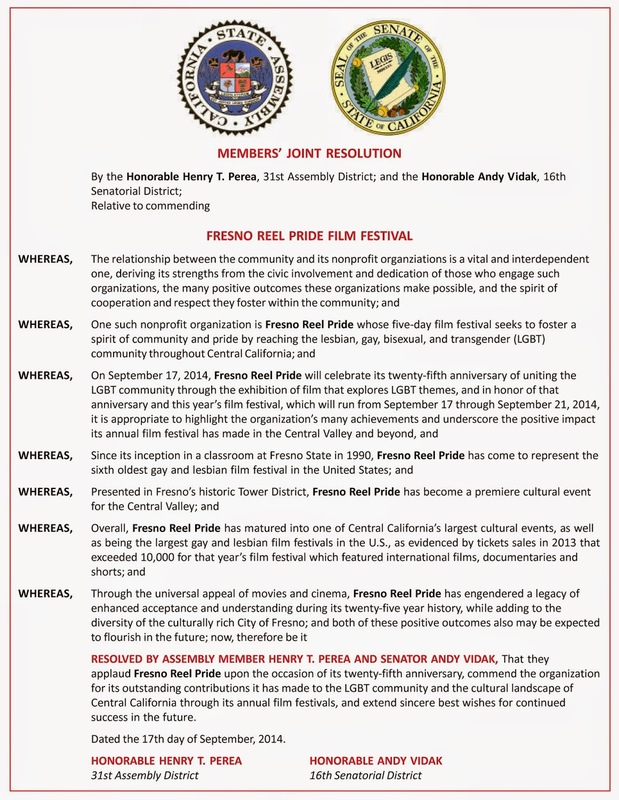 Finally, I urge all members of our diverse community and our allies to attend Fresno Reel Pride’s 25th Annual Film Festival. You will be pleased for our community, and most of all, you will be proud of our community. Thank you.